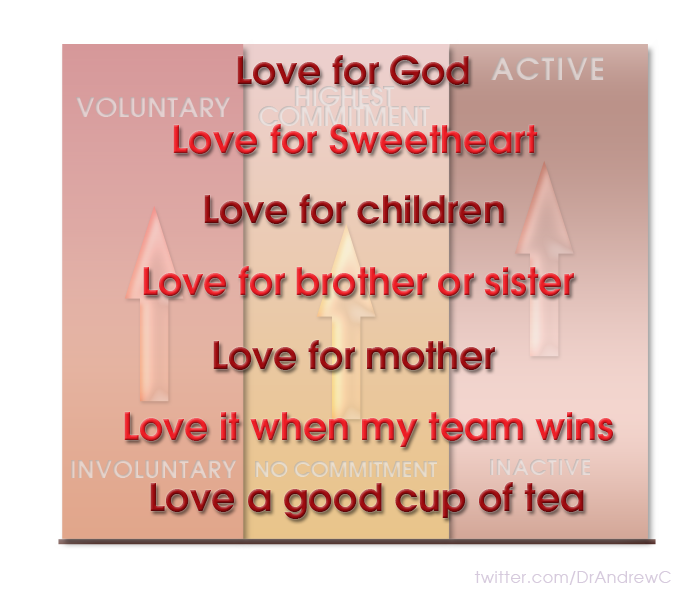 Gifts are, according to Dr. Gary Chapman (the author of The Five Love Languages) a "love language". I suspect though that the best-selling author may have misrepresented the linguistic power of gifts as only capable of expressing degrees of the warmest aspects of a person's affection for another. Take it from me, gifts not only speak the dialect of affection, they also speak volumes about what a person feels generally - and who this giver really is. Every gift narrates a story. When David's mighty men brought their Commander a cup of cold water from the well of Bethlehem, they weren't just giving him water. This gift in a cup told a story that introduced three loyal and devoted generals who were prepared to risk their lives to bring delight to their king. This well-water spoke the language of war and told of night skirmishes, breaching through enemy ranks in the dead of the night - just to get a cup of Bethlehem well water. This cup of water spoke volumes about their unquestioned willingness to obey David. Little wonder then that David, who was fluent in the language of Gift, recognised that such use of this language by these mighty generals was not merely the vocabulary of devotion but was in fact: worship (the highest form of love), which is why he poured it out on the ground to the Lord as a gift to God. One of the most embarrassing experiences Kim and I have ever had with gift giving happened at a time when we were particularly struggling financially. We had been given a very beautiful under-glass torsion-pendulum clock. It was still in its original box. We thought it would make a great Christmas gift for my brother and his wife. When my brother rang to thank me for this most generous gift, his first statement was: "That church you served at in Melbourne must have really loved you guys!" "They sure did!" I replied. "Yeah, I could tell by what they engraved on the brass base of the clock you just gave me!" No matter how much I pleaded with my brother to let me redeem my embarrassment, he was adamant there was no way he was going to give this back - or let me ever live it down! We had made a terrible mistake with the language of gifts. We had given a gift that had cost us nothing. as describes the gifts God has given each one of us to give to others (Romans 12:4-6) and then how we are to live as a local church by giving not just our gifts but ourselves to our church family (Romans 12:9-21). It is my hope that we can each learn the language of Gifts by discovering God's great gift of His Son to us, the various gifts He has given to us to share with His other great gift to us - our spiritual family, our local church. As we learn the language of Gifts we learn that why we give is a direct reflection of what we give. This is why Jesus commended the poor woman who gave two small copper coins as being more generous than the wealthy who gave much much more but only gave to be seen and impress others (Mark 12:42). For all that Christ has given us, let us give Him our best - our best effort, our best talents, our best attention, our best gifts, so that more people will come to receive His best gift for them. See you in "the Gift Centre" (church) this weekend. Jesus was asked, "Teacher, what is the greatest commandment in the Law?" (Matthew 22.36) There's many things He could have said, feed the hungry, clothe the naked, shelter the homeless, defend the rights of the oppressed, and while all of these are commandments in the Law of Christ, none of them are the greatest! What I find fascinating about the New Testament documents is that for all the difficulties that the apostles of Christ faced toward the end of the first century, doctrinal heresies, declining church attendance, sexual misconduct within the churches, increasing moral decadence outside the church, increased persecution from the State, and a rise in evangelistic apathy among believers, all of them appealed to this greatest commandment in their closing letters. Love comes in a variety of forms and even though in English we really only have the one word which can apply for all forms, there is quite a distinction between them. We love a good cup of tea. We love it when our team wins. We love our mothers. We love our brothers and sisters. We love our children. We love our sweetheart to whom we are married. We love God. 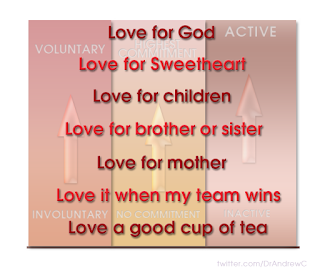 I have deliberately attempted to progress up the scale of love with these examples of how in English we use the one word ("love") to describe these various delights. Corresponding to this upward scale is another upward scale going from "Virtually involuntary" to "I chose to, because I benefit" all the way up to "A voluntary choice even when I do not benefit and it actually costs me". Decisions create Actions and Actions create Feelings. If you want to feel love for someone, then you must first decide to, then secondly, do loving acts for that person. The who has been redeemed by God has received a complete change of heart and mind. Their will has been healed from the ravages of sin's evil lurings. They now chose to love the One who has redeemed them. "But I have this against you, that you have abandoned the love you had at first." John had previously written to the Ephesian believers and told them plainly how to love God. What he said sounded uncannily like the second part of Christ's answer to His questioner. ¶ For this is the message that you have heard from the beginning, that we should love one another. John used the word brother to speak of the believers brothers and sisters in Christ. While the believer is called to love all people, we are called to especially love our fellow brothers and sisters. Understanding that the deepest, highest form of love is a totally voluntary, completely devoted to, and selfless serving act, it is then possible to see how God can command it. For the believer, God's commands are not a burden (1John 5:3), rather, they are a means of grace. That is, there is power within the Word of God for the believer to obey the Word of God. The love of God which Christ calls His followers to is a commanding love. Thus, Christ is commanding love. In this sense, it is a verb (something He is doing). But it also describes the kind of love that God calls for. In this sense it is an adjective (a description, and a quality). To help His followers to keep this great two-part command, Christ said, "I will build My Church!" (Matthew 16:18) This is why attending the House of God each weekend is not merely about being religious, or even traditional - no - and a thousand times "No!" It is about loving Jesus! When we all gather on the Lord's Day to worship God together, to share in Communion together, to receive instruction from God's Word together, and to pray for one another together - we are loving Jesus! When Saul the Pharisee was waging persecution against the Church he was struck from his horse on the Road to Damascus and questioned by Christ, "Saul, Saul, why do you persecute Me?" (Acts 9:4) To love Christ is to love His Church and especially the local church of fellow brothers and sisters where He has placed you in His body. This is why it is for the love of Christ that I go to church this Sunday, and I invite you to fall in love with Jesus afresh this weekend in His church, your church, as well.